Good evening ladies. I am glad to be here, although I almost wasn’t. You see I am currently in that awkward blogging stage where I don’t have anything to blog about just yet. Although my head is full of posts half-written and my hands have been busy with a fair number of projects, none of it is blogworthy just yet. Tomorrow is Kate’s – she is a Centsational Girl – special linky party where people are sharing picnic and BBQ ideas. And I blogged about a BBQ idea once. But there were only a handful of people reading me back then, so I thought it might be a good idea to do a rerun, sort off. We love to BBQ, we love fish, we love to BBQ fish. 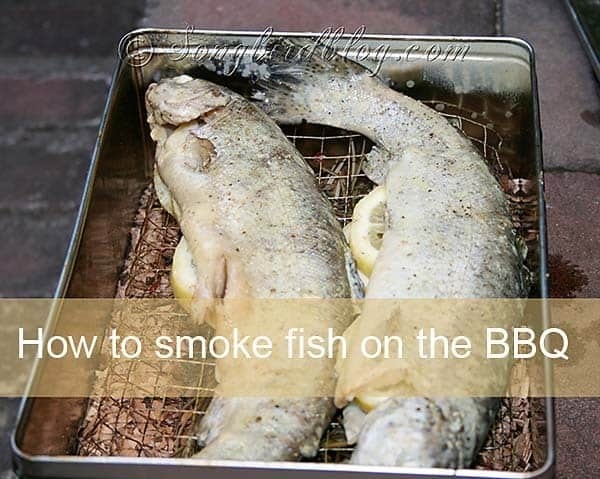 But most of all we love to smoke our fish on the BBQ, and it is really easy. My sister who lives in New Zealand taught us how to do it when she visited us. She brought a bag of wood chippings all the way over from there to here, just for that…. And we are forever grateful…. This is what you do. You go thrift shopping (yes another excuse to go for a hunt, hé I told you this was good) and find yourself a nice big tin. I found a square one and those are actually best. Make sure that the tin has some height. Then go into your garden shed and get a piece of chicken wire (non coated). Fill the tin with a layer of wood chippings. We got the real ones made from New Zealand Manuka trees, but apparently the kind you buy to put in a bunny cage work too. Cover the wood chippings with the chicken wire. Make a little tray out of it. But first (I almost forgot) add some herbs to the chippings too. Then put the fresh fish on the chicken wire. Punch some holes in the tin’s cover and close the tin. And then simply put it on the hot BBQ. Salmon is finished after 10 minutes, trout takes a little longer. And you can of course reuse your tin and chicken wire over and over again, just add some fresh chippings every time. My Love, who wishes to remain anonymous, bringing this years home smoked salmon to the table. Trust me freshly smoked salmon tastes great! I don’t think this recipe is actually a ‘kiwi-sis’ original, I might have heard that Jamie Oliver wrote about it , but for us home-smoked-salmon will forever be my sisters recipe. Looks good…I love that you put Jamie's face in this picture….lol. Hmmm, zalm! Dat klinkt goed! Dit klinkt erg lekker…!! En wat geweldig dat je Jamie als kok in hebt weten te huren hihi! Just a question.. shouldn't you punch any holes in the tin? (either in the bottom or the top?) – Am I correct in thinking it's closed entirely and then put on the BBQ?